Alistair coaches business leaders one-to-one to help them 1. Create, 2. Effectively Communicate and 3. Integrate / Live their business and life style visions. Alistair has conducted business vision consultations, key note speeches, presentations and ‘Business Leadership Visualisation Workshops’ internationally for over 10 years working with small, medium and large businesses. How do we more effectively visualize and create visions for our business that are more vivid and purposeful and in doing so develop clearer more inspiring business goals, priorities and strategies? How do we create and communicate business visions that increase the levels of inspiration, enthusiasm and engagement throughout our business? How do we develop our potential as visionary leaders? How do we ensure our business vision is aligned with our values? How do more effectively nurture and harness the vast power of visualisation to increase the productivity, creativity and innovation levels that are essential for our business to flourish? How do we communicate a memorable business vision that engages and inspires the stakeholders of our business? How do we use the underlying story in our business vision to measurably improve the results of our marketing and sales campaigns? Many business visions are ‘strategic visions’ or ‘visions of big goals’, which while they are important, often lack the purpose and meaning to inspire and enthuse stakeholders and most importantly they do not give the business it’s ultimate clarity of direction. 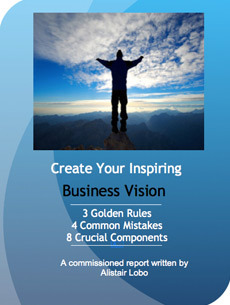 For more insights about business vision, please download Alistair’s Report “Create Your Inspiring Business Vision“.